1. The Chengdu American Center for Study Abroad is formed by a consortium of accredited American universities which offer both summer and semester courses from their official catalogs, and which are open to all American and international students, not just Chinese international students returning home for the summer; G-MEO's Shanghai Center falls under this consortium agreement for its programs. 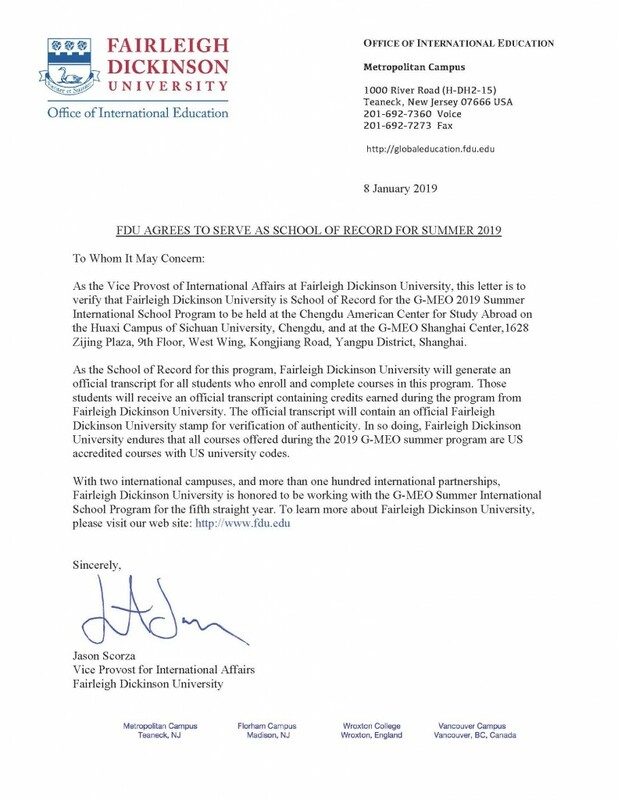 Upon successful completion of the program, one copy of official transcript from Fairleigh Dickinson University will be mailed to student's home institution or other location required by students. It will be students' responsibility to communicate with the related office of their home university in order to complete the credit transfer process.Please note that different universities have different procedures/steps to be taken in order to complete the credit transfer process after completing courses outside of the university. Additionally, different universities will have different policies on whether the grades you earn during a summer program will count as letter grades (ex. A, B, C, etc), or if they will count as Pass or Fail courses. Please consult your registrar's office for more information. You are registered as Florham campus students. Please follow the instruction on the website.